Boasting a smoky aroma and a myriad of savoury flavours, the KL Hokkien Mee (RM8.50) is not one to skip. Stir-fried to dark, caramelised perfection, each mouthful greets you with little surprises of crunchy lard morsels and a sweet, lip-smacking caramelised flavour courtesy of the dark sauce added. The noodle variety used is also thicker (similar to Japanese udon) allowing more sauce to latch on and giving the dish more chew. Adorned with many vibrant colours from bits of char siew, prawn, diced green onions and egg, the Yang Zhou Fried Rice (RM8.50) is great to have if you’re just looking for something simple to fill the tummy. 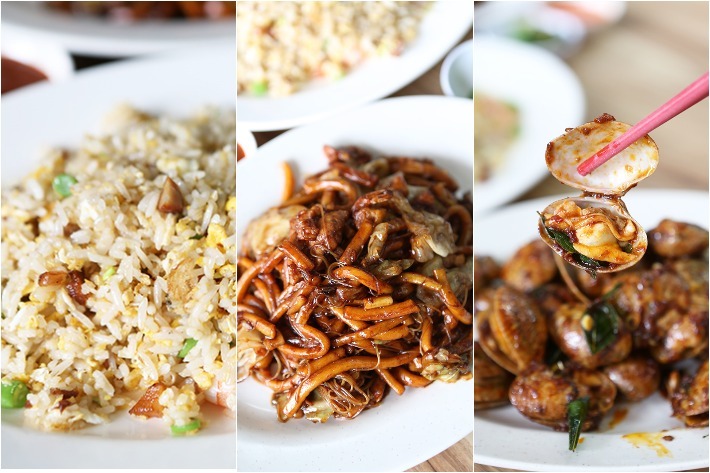 Their rendition of the popular Chinese fried rice dish is lighter in flavour and not as oily, which serves as a good option if you should decide to order cooked dishes to try. A dish we were recommended to try was their Spicy La La (RM15), which ironically was disappointing, to say the least. Albeit the clams were fresh, the dish itself was bland tasting save for subtle hints of curry leaves, chilli and garlic. Went there on Sunday 10-March-2019 at 11.30am but closed. It is clear that not open daily. Spent time going there and closed. No point going..